This is an unusual book! 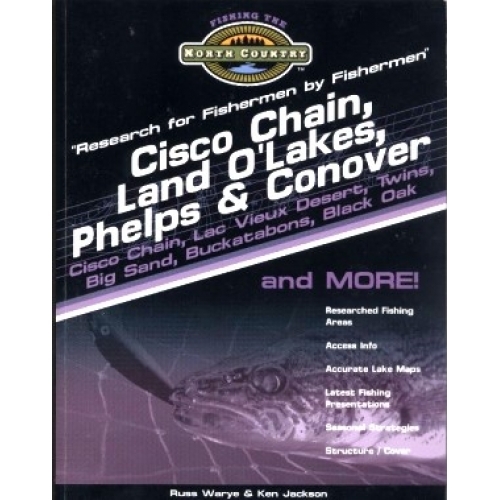 It covers the largest geographic area of the series and includes significant fishing resources in Michigan namely the Cisco Chain (Thousand Island, Cisco, Lindsley, East Bay and more) and Duck Lake. This waterway represents approximately 4,080 acres including Clearwater Lake (not in the book). It is a complex 4,080 acres with lakes of different sizes, winding channels and an outstanding variety of structure and cover. Additionally, there is an incredible array of famous Wisconsin northwoods lakes. The boarder waters of the Cisco Chain include Big, West Bay and Mamie - all lakes with the ability to produce numbers as well as trophies. Additionally, the authors have chosen to add Duck Lake, a famous fishery just north of the town of Land O'Lakes Wisconsin. In Land O'Lakes proper, the famous destinations include Black Oak, Forest, and Big Portage, among others. Moving eastward to the Phelps and Conover region, Lac Vieux Desert, North Twin, South Twin, Big Sand, Long, the Buckatabons, Pioneer, Stormy, and more, are premier fishing locations researched for your study. Lac Vieux Desert and North and South Twin rank on everybody's list of favorite fisheries of the state. The region is anchored by three tourist centers - Land O'Lakes, Phelps and Conover. Two are sited at the top of the state - Lank O'Lakes and Phelps while Conover is south of Land O'Lakes on U.S. 45, the important hwy link to this area. The Nicolet National Forest's western border falls within the area, and obviously serves as an important destination for outdoor enthusiasts, besides anglers. Additionally, the Ottawa National Forest makes up the majority of the Michigan boarderland, and offers more angling adventures. 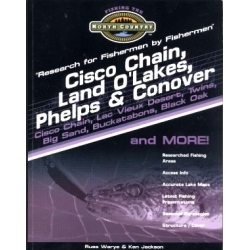 Some of the lakes included in this book are: Alva, Baker, Big Lake (Cisco Chain), Big African Lake (Cisco Chain), Big Portage, Big Sand Black Oak, Buckatabon (Lower), Buckatabon (Upper), Cisco Lake (Cisco Chain), Clair, Deadwood, Dorothy Dunn, Duck Lake (Michigan), East Bay Lake (Cisco Chain), Fishhawk Lake (Cisco Chain), Forest, Helen, Hunter, Indian, Indian Lake (Cisco Chain), Jean, Joyce, LAC du LUNE, Lac Vieux Desert, Landing, Lindsley Lake (Cisco Chain), Little African Lake (Cisco Chain), Little Portage, Little Tamarack, Long Mamie Lake (Cisco Chain), Marshall, Merrill, Mill, Morley Lake (Cisco Chain), North Twin, Pioneer, Poor Lake (Cisco Chain), Record Lake (Cisco Chain), Smoky, South Twin, Spectacle, Spring, Stormy, Sugar Maple, Thousand Island Lake (Cisco Chain), Tower, West Bay Lake (Cisco Chain).